Previous Article 6mm NRL Cataphracts! Lookingb the goods mate. How are you fixed for BKC 6mm opponents up there? Fantastic — out of curiosity, could you integrate railroads into your games and have these go faster across the “map”? Also, what rules are you using for these? Something like Bolt Action or Flames of War? I’m painting for and using the figures with Blitzkreig Commander II. 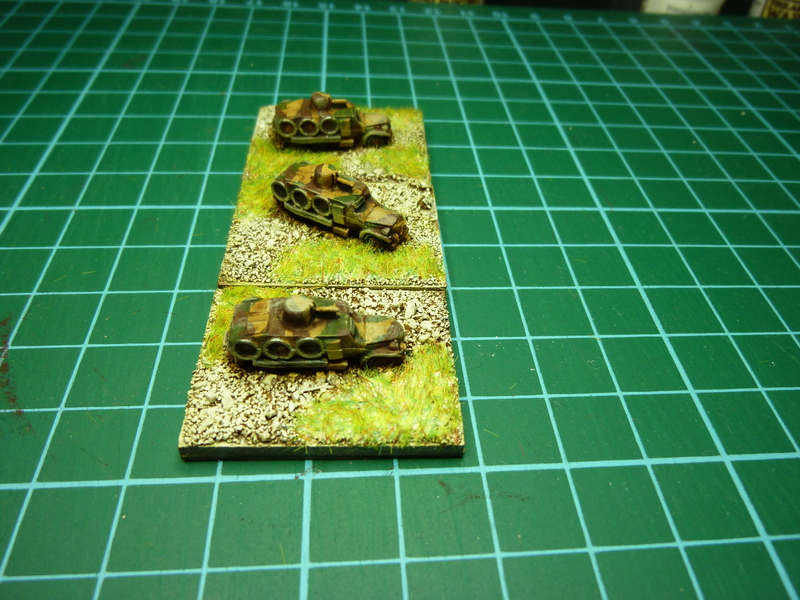 That allows me more vehicles on the table than Bolt Action and avoids the Wall-to-wall artillery and tanks of Flames of War – and they give a good fun game. Thanks Thomo – by the way, the Heroics and Ros page you linked to seems to offer those miniatures at what look like VERY cheap prices, but there are no photos. What do those look like? Do you have any posts of unpainted Heroics & Ros models, or the CinC or GHQ ones for that matter? I am looking to get into wargaming but have yet to decide on the scale. I have many unusual tank model kits but most are 1/35 scale, with some 1/72 scale I heard I might be able to use with some rules like Flames of War. But these miniatures are also quite neat and seem like they would not break the bank. Thoughts for a guy who wants to avoid a $200 plus initial investment for a basic Japan vs. British (maybe with some Indian troops) scenario? Davco from Skytrex also made a range that was IMHO, slightly poorer quality than H&R. Scotia Grendel also make some vehicles. In addition there was a guy call Ian Armstrong I think who was also making 6mm but just the odd things that no-one else did like portees. As to quality, I reckon most of the H&R stuff paints up well, although to be honest, once you start working with GHQ, the detail on the vehicles is such that they almost paint themselves. I’m not sure I have any naked photos of the same vehicles from all three and then painted versions of the same but I have done all H&R armies, especially when finances have been tight. Have a search here for Denmark or Danes or Danish. That was a modern(ish) army I did for Modern War Commander. I can’t find the link easily at the moment as I’m answering this on the phone rather than the PC. Anyway, I reckon H&R are good value for money and to be honest, their infantry is superior to GHQ I reckon. By the way, it looks like they have the rules I wanted in Blitzkrieg Commander II with this section: World War Two: Far East 1941-45 (America, Britain & Commonwealth, Japan) — but I’m not sure if it has the sort of “Fun” nation-specific rules as in Bolt Action: Armies of Imperial Japan, a sourcebook I own (which is about all I own). The different doctrines are reflected in the command and control rules along with the mix of weapon types. With the Russians complete and the Japanese half done, next will be some Hungarians, then late Russians then some early Russians (maybe more cavalry and infantry) to make some Mongolian divisions – as an additional opponent for the Japanese. One more! Does Blitzkrieg Commander II cover amphibious rules – I was hoping to find a way to integrate the Type2 Ka-Mi, Type3 Ka-Chi, and Type4 Ka-Tsu into games with the SNLF as surprise attack landing units. I’m pretty sure it does. I’ll have to have a look later as I’m away from the rules at the moment. First – the H&R Danes – see https://thomo.coldie.net/2010/03/16/cold-war-commander-danes/ and there are photos of everything in that army. Also, for bases, I just use Flames of War bases 🙂 the small bases are good for infantry and most vehicles, the medium bases work well for deployed artillery. The bases make them easy to handle and to transport – magnetic bottoms. 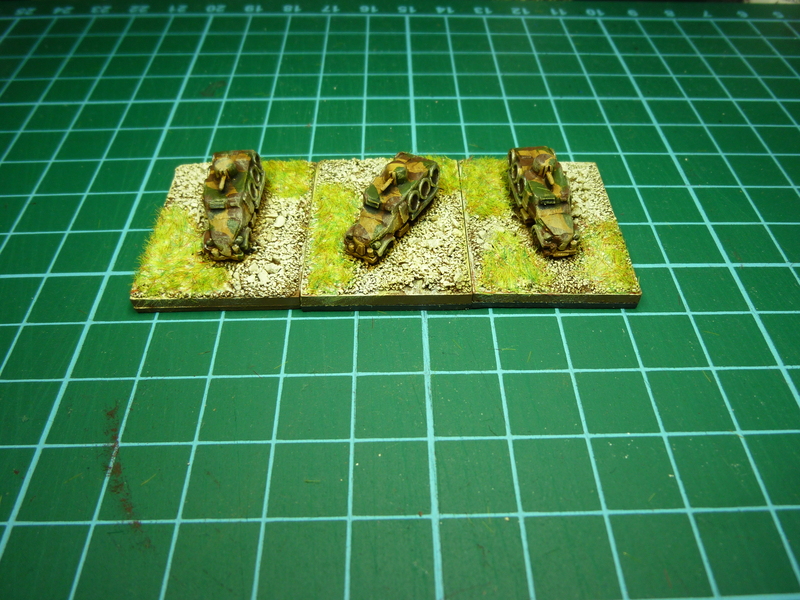 Also you’ll need them for the infantry and heavy weapons. I usually stick a tree on command bases to make them easy to see but don’t tell my opponents.